Fringed by Europe’s highest mountains, Mont Blanc, the Matterhorn and Monte Rosa, veined with valleys and studded with castles, Valle d’Aosta is undeniably picturesque. The central Aosta valley cuts right across the region, following the River Dora to the foot of Mont Blanc on the French border. Along the river are most of the feudal castles for which Valle d’Aosta is famed – the majority built by the Challant family, who ruled the region for seven centuries. Although the castles are pretty from the outside, and easily accessible by bus or train, few are absorbing enough to warrant a special trip into the region. But as skiing and walking country, Valle d’Aosta is unsurpassed. 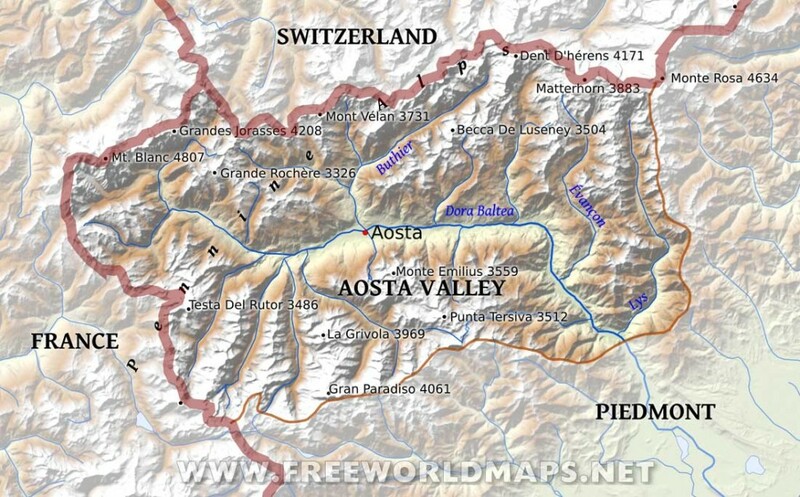 Valle d’Aosta is the least Italian of all the regions. Its landscape and architecture are Swiss, the official language French, and in some valleys the locals, whose ancestors emigrated from Switzerland, still speak a dialect based on German. In fact, although Italian is more widely spoken than French, bilingualism is an essential part of Valle d’Aosta’s identity, which is quite distinct from other parts of the north – a distinctiveness reflected in its greater administrative and financial autonomy. Aosta, the regional capital, is the only town of any size and, with its attractive cobbled streets and good shopping, it makes an excellent staging post on the way to the smaller mountain resorts. As for the countryside, the main valley is for the most part rather bland, and it’s in the more scenic tributary valleys that you’ll want to spend most of your time. The eastern valleys are the most touristed, with ski resorts and narrow, winding roads that can get choked with holiday traffic. If you’re walking, you’re best off heading for the valleys in the west, inside the protected zone of Italy’s largest national park, the Gran Paradiso. The valleys here can also be busy – the mountain rifugi as well as the hotels get packed in summer – but development is restrained. Getting around on public transport demands patience. Buses run from Piemonte along the main valley past most of the castles, but buses into many of the tributary valleys are rare. The road branches off at Aosta into Switzerland via the Grand-St-Bernard Pass (where you can stop to take clichéd photos of the famous dogs) and forks again some 30km further west at Pré-St-Didier: both branches run into France – the southern via the Petit-St-Bernard Pass to Chambéry, the northern to Chamonix through the Mont Blanc tunnel. Because of the border posts, the road is much used by long-distance lorries, which are something of an earache and eyesore. Trains are less regular and run only as far as Pré-St-Didier, but by using a combination of the two, you can get just about everywhere, though for serious exploration of the quieter valleys, your own vehicle is a definite advantage. Valle d’Aosta is a vertical region, you might say, and not just in the physical sense, for the many high peaks that surround it (including Mont Blanc, the highest mountain in Europe at 4,807 meters), but also for the surprising concentration, in a region of such reduced dimensions, of so many natural splendors, of so many monuments, of so much precious historic and artistic heritage, of a density which evokes, in its vertical aspect, the crowding of skyscrapers in a metropolis where horizontal urban space is scarce and precious.Aosta, the regional capital and the only province of the Valley, is a city rich in history. Traces of the ancient Augusta Pretoria (the Latin name of Aosta) can easily be seen, such as the great Arch of Augustus (25 B.C.) and the remains of the Roman Theatre.For Aosta the Middle Ages were anything but dark: as an important center of commercial traffic with France and Switzerland, the city enjoyed a long period of prosperity. It is no coincidence that the Cathedral and Cathedral Church of S. Orso, two churches of great beauty, date back to the Middle Ages.This guide covers visits to the mountain region of Aosta Valley, with description of several itineraries to visit the valley.The locations covered are the city of Aosta, the lower valley with its castles, a visit to Cogne and the Gran Paradiso Park, a visit to Morgex, La Thuille and the Piccolo San Bernardo Pass, one to Courmayeur, one to Valpelline and the Gran San Bernardo Pass, and all the villages of the Valtournance Valley.There are extensive descriptions and photos of the attractions.It has listing of many reviews for the best recommended restaurants for all the locations, you have the basic information ready: the name, address and telephone number are included in the guide together with the review.